Let Us Thank Governor Pataki! Wake Up Sleeper, Let Jesus Shine On You! How Can Zinda Be Supporting Sargon Dadesho? The VeggieTales Videos is a collection of more than a dozen 30-minute animation videos that teach Christian morality to very young children by telling Biblical stories through the adventure of a family of googly-eyed vegetables. Since 1993, 15 VeggieTales videos have sold over 30 million copies. Now a full-length feature VeggieTales film under the title of " Jonah: A VeggieTales Movie" aims to reach a new audience of mainstream adult moviegoers. The timing of the release could not be any manipulative, just as the American public discussions on the necessity of going to war with the ancient homeland of the Assyrians is heating up around the world. The theme of “Jonah” is simple: how can we show mercy and compassion to other people - even bad guys. Bad guys, in this case, being Assyrians. How about taking your 4 year-old to a movie theater near you and let her discover for herself how an Asparagus (Jonah) saves the bad guys (Assyrians) with the help of his friend, Larry the Cucumber? As innocent as this may sound, the screening of such large-scale movie production may leave a very negative impression on our Assyrian children, and enforce a feeling of inferiority when identifying with the “bad guys of Nineveh”. What should we do then? In short, begin by demanding a public apology from the officials of the studios distributing this film and to the producers of the VeggieTales Videos. Assyrians naturally want to have a sense of positive identity portrayed in the media when such names as “Nineveh”, “Assyria”, “Gilgamesh” and so on appear on the silver screen. When carefully examined, the film “Jonah” teaches our children nothing differently from what the Christian scriptures have for the past 2,000 years. The Bible tells us that Jonah was sent to save a godless, adulterous, and unrepentful people in Nineveh. Biblically-speaking, the Ninevites were “the bad guys” and Jonah was the “good guy” called upon Yahweh on this important mission to save the fish-slapping veggies in Bet-Nahrain. Two thousand years of misinformation and historic inaccuracy is finally catching up with us and is blowing onto our rosy faces in mega-size proportion with a group of vegetables saving our Great City of Nineveh. In spite of becoming a target of enormous negative attention in many religious circles, especially those who know little about the factual Assyrian history, this magazine believes that to criticize the film “Jonah” one must also criticize the story of Jonah in the Bible. The name “Jonah” and his big fish do not appear in any ancient Assyrian documents found in Mesopotamia or around Nineveh. The Assyrians of the ancient world were no more brutal than the Israelites entering the Canaan after 400 years of captivity in Egypt, Hittites attacking the city of Babylon, or the Medes’ conduct against the Assyrians in 612 B.C. Since the authors of the Old Testament were at times enslaved by the monarchs of the Assyrian Empire, it is reasonable to expect a certain skewed reality in describing their captors. Let’s not be too quick to judge the film “Jonah” though. Instead, let’s be more concerned about what our children are taught about our past history in our churches and Sunday Schools. “Jonah” challenges our expectations and makes us uncomfortable. If we were indeed the “bad guys” of the ancient world, as our pastors preach to us at every Rogation of the Ninevites sermon, then this animation film’s ghastly depiction of Assyrians must not evoke any ill-feeling. If the contrary is true, then a thorough examination of our Churches’ teachings deserves our immediate attention. The story of an asparagus saving Nineveh is no more fantastical than a big fish eating a man and regurgitating him after three days. Whether it’s a vegetable or a Jewish prophet that saved the most important city of the ancient world does not behoove our attention, rather knowing that virtually every characterization of the ancient Assyrians in modern media, school books, Sunday School material, and our own churches is negative and harmful to our children’s self-identity. The most effective way to counter such falsifications is to present our own videos, teaching materials, and films on the big screen. 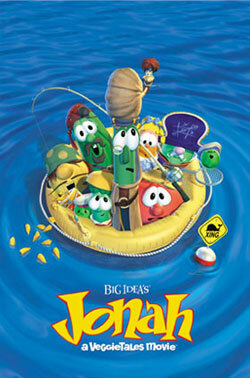 So take your 4-year-old to “Jonah: A VeggieTales Movie” and expect to be immediately disturbed. Then calmly return home and explain to her the rest of the story, that when the Assyrians heard Jonah they began to love God and for the next two thousand years suffered terribly for their repentance. But God still loves them and will not forget His promise. Jonah’s people, on the other hand, crucified Jesus, became very rich and owned many many film studios in Hollywood and ridiculed the suffering Assyrians. The Assyrian of today wishes to make himself known. He searches for his living memories, keys to his cultural, ethnic, and political identities. The Syriac Chronicles are a good source to the understanding of his History. For instance, the Assyrians, sometimes, complain to have had no king in the Christian era. 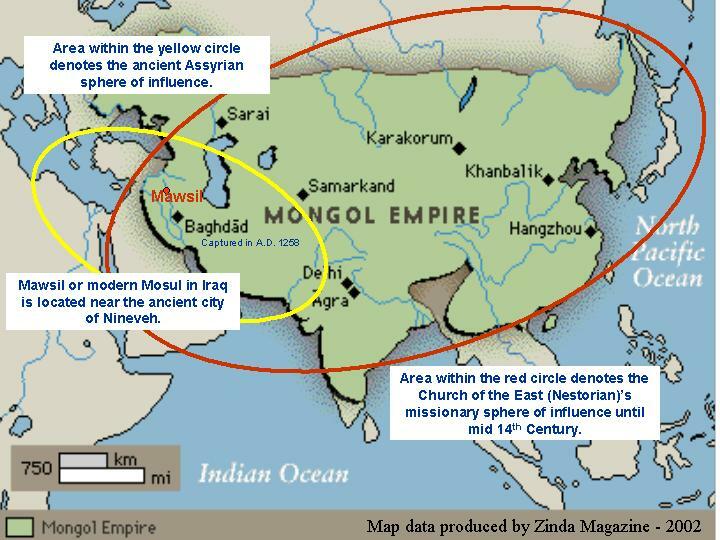 However, during the Mongolian Empire they had a great king in Mâwsil (Mosul), a Mesopotamian city. He name was Mas’ud and this is his story. In 1206 the Mongols -- the nomadic tribes of Central Asia-- joined forces, headed by the famous Temujin (Gengis Khan) and dashed into a series of conquests. In the East, they seized China of Song and the Tibet. In the West, they captured and plundered the city of Baghdâd in 1258, and put an end to the dynasty of the Arabic khalîfahs. The Christians of Syria, Palestine, Mesopotamia and Asia Minor had waited for the arrival of the Mongols, hoping for an improvement of their condition. They expected great changes: no longer to be considered “Dimmi”, or lesser citizens. As the believers of the others religions, they met considered themselves equal to the King of Kings in the Khanat where they encountered greater tolerance. Correspondence was established with China and with Europe. They lived under the first Il-Khans of Persia for a peaceful and prosperous period. They built churches, spread some missions, increased their literary productivity. The story of King Mas’ûd is inspired by “The Chronography” written by Gregory Abû’l–Faraj (1226-1286), a doctor, a patriarch, a great Syriac writer. He lived in the court of the Mongols. He is known to Europeans as Bar Hebraeus. 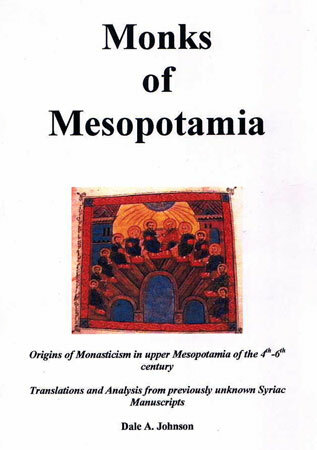 “The Chronography”, written in the Syriac language, begins from the creation of the world until the Mongolian Period. It is divided into two parts, Chronicum Syriacum, dedicated in political and civil history, and Chronicum Ecclesiastical, which deals with the patriarchs of the Church of the East. After the death of Gregory Abû’l–Faraj, on the 30th of July, another writer, perhaps his brother Bar Sâwmâ Sâfi, wrote, in the following years, the political history of the world. On 7 June, in the year 1277, the Kurds made a new raid against the western Syrian monastery of Mâr Matta, near Mâwsil, and kidnapped the monks. The next year, the troubles and the rivalries began. Ma’sûd was libeled by the Persian Nasir al-Din Pâpâ, the former governor of Mâwsil. Ma’sûd and Asmût were dismissed after a board of inquiry. Pâpâ ruled over Mâwsil in their place. Mas’ud and the noble Ashmut accused Pâpâ and his judges of corruption. In the year 1280, they went to Abâkâ Khan and asked him to reopen the inquiry which lasted one month. Papa the traitor was executed around the same time that a Persian, Jelâl Ad-Dîn Tûrân on August 8, was beheaded and whose head was brought to Mâwsil and exhibited. In the summer A.D.1281, the Persians of the house of Jelâl Ad-Dîn Tûrân and of the house of Pâpâ stirred up a quarrel against Mas’sûd . They claimed that he had carried off a great quantity of the treasure from Jelâl Ad-Dîn’s gold and precious stones. Mas’ûd was arrested, tortured, and condemned. He was brought back to Mâwsil but fled by night. In the year A.D.1284, Arghôn, the son of Abâkâ, sat on the throne of the King of Kings. He did not forget his friends. The marauders brought the spoil from the city all day long, they looted and robbed the whole of the people. They plundered Mâwsil‘s commercial districts and took by leaving 500 slaves. Ma’sûd, in the citadel, had not been able to prevent this looting. Hereupon Ma’sûd’s story finished sadly; his monarchy lasting only five years. 1 Ighûrâyê, one of the Mongol tribes. 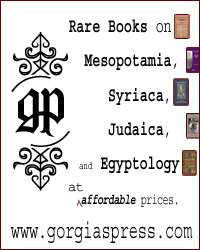 2 Ernest.A.Wallis Budge, The Chronography of Gregory Abû’l-Faraj 1225-1286, known as Bar Hebraeus, translated from the Syriac into English, London, 1932, APA-Philo Press, Amsterdam, 1976.. P. 456. Mr. Barzani explained that the since 2001, there have been two new Directorates of Education, one for Turkmen and one for Assyrians. These Directorates administer the educational programs of the Turkomen and Assyrian communities. In North Iraq a complete educational curriculum is offered to grades one through twelve in the Assyrian (Syriac) language. By the beginning of 2002, 625 Assyrian teachers were instructing 8,359 students at 34 Assyrian schools. New school text books continue to be translated into Syriac and printed in large numbers and made available to these Assyrian students. Mr. Barzani futher commented that: “In the general community, Assyrians and Turkomen take part in all aspects of life. They have educational, cultural, and sports associations, form their own trade unions, and have established many political parties. They publish, in their own languages, books, magazines, and newspapers that are available for sale in the local markets. These communities broadcast radio and television programs in the region in their own languages as well. Assyrians and Turkomen form a vibrant part of the overall community of Iraqi Kurdistan." Barzani continued to say: "Within the Kurdistan Regional Government, there are one Turkmen and three Christian cabinet ministers. Christian parties hold five seats in parliament. The Iraqi Turkomen Front refused to participate in both the 1992 election as well as the 2001 municipal elections. Many people from minority communities, Assyrian, Chaldean, Turkomen and Armenian, live in cities and towns under the control of the central government. No accurate statistics exist about their population numbers." Barzani also answered a question related to the reports of Assyrian International News Agency (AINA) on Kurdish repression of Assyrians and said: "We have experienced a few isolated incidents, from which no country or community in the world is immune, and the victims have come from all walks of life and all ethnic and religious groups. There are unfortunately small groups of malcontents who allow themselves to be used by foreign organizations to forward their own interests and from time to time this has caused problems in the region. The opinions of these groups are not, however, representative of views held by the majority of minority communities living in the region." 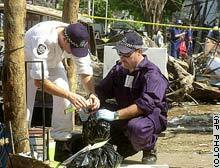 (ZNDA: Sydney) According to an unofficial list of the dead, missing, injured Australians following the bomb blast in Bali, Indonesia last week 30 Australians have been confirmed dead and 140 Australians remain unaccounted for including an Assyrian, Miss Christina Betmilik. At press time Zinda Magazine was unable to obtain further information about Ms. Betmilik’s residence in Australia. The car bomb that exploded on the resort island of Bali on Saturday killed more than 180 people — most of them Australians — and forced Indonesia's government to acknowledge for the first time that al-Qaeda is active in the southeast Asia. 98 percent of Turkey’s 65.6 million is Muslim, the majority of whom are Sunni. The only sign of improvement concerning the Assyrians was the reopening of a Syriac Orthodox church in November 2001 in Harput, Elazig province. The church, second oldest church building in Turkey, was closed in 1950. According to the Report, the Office of Foundations (Vakiflar Genel Mudurlugu), regulates the activities of non-Muslim religious groups, churches, monasteries, and religious schools. There are 160 "minority foundations" recognized by the Vakiflar, including Greek Orthodox (approximately 70 sites), Armenian Orthodox (approximately 50), and Jewish (20), as well as Syrian Christian, Chaldean, Bulgarian Orthodox, Georgian, and Maroni foundations. · Non-Muslim religious foundations legally may not acquire property for any purpose, although under certain circumstances foundation property may revert to the State. In November 2001, this legal status was reconfirmed, when the Supreme Court ruled that such foundations were established under the Ottoman sultanate and therefore could not be expanded under existing law. The Armenian Patriarchate publicly protested the Supreme Court's ruling on the grounds that this policy significantly would affect its and other faiths' ability to sustain themselves…Normally all "religious" foundations had to have been in existence since the early days of the republic in order to be deemed as such. Other Protestant groups are engaged in the lengthy process of applying for permission to form foundations. Some religious groups have lost property to the State in the past, or continue to fight against such losses. If a non-Muslim community does not use its property due to a decline in the size of its congregation to under 10 individuals, the Vakiflar may assume direct administration and ownership. If such groups can demonstrate a renewed community need, they may apply to recover their properties. · Government authorities do not interfere on matters of doctrine pertaining to non-Muslim religions, nor do they restrict the publication or use of religious literature among members of the religion. · There are legal restrictions against insulting any religion recognized by the State, interfering with that religion's services, or debasing its property. · Under the law, religious services may take place only in designated places of worship. Under municipal codes, only the State can designate a place of worship, and if a religion has no legal standing in the country it may not be eligible for a designated site. Non-Muslim religious services, especially for religious groups that do not own property recognized by the Vakiflar, often take place in diplomatic property or private apartments. Police occasionally bar Christians from holding services in private apartments. · Upon written verification of their non-Muslim background, minorities "recognized" by the Government under the 1923 Lausanne Treaty (Greek Orthodox, Armenian Orthodox, and Jewish) are exempted by law from Muslim religious instruction. These students may attend courses with parental consent. Other non-Muslim minorities, such as Catholics, Protestants, and Syriac Christians, are not exempted legally; however, in practice may obtain exemptions. The courts have ruled that all universities are public institutions and, as such, have an obligation to protect the country's basic principles, such as secularism. Small, peaceful protests against this policy occurred at various times during the period covered by this report, and some journalists and supporters face minor charges relating to their roles in the protests. · Restoration or construction may be carried out in buildings and monuments considered "ancient" only with authorization of the regional board on the protection of cultural and national wealth. Bureaucratic procedures and considerations relating to historic preservation in the past have impeded repairs to religious facilities, especially in the Syrian Orthodox and Armenian properties. However, according to religious leaders, the Government has become more supportive of these communities' requests. Groups are prohibited from using funds from their properties in one part of the country from supporting their existing population in another part of the country. (ZNDA: New Britain) Mary Yaghobian of New Britain died Tuesday, 15 October. She was 74. Mary was born in Iran and lived in New Britain since 1990. She was a member of St. Thomas Church of the East in New Britain. She is survived by two sons, Edison Betzomayeh of San Jose, Calif., and Edmond Betzomayeh of West Hartford; two daughters, Esther and Helen Betzomayeh, both of New Britain; three brothers and a sister in Iran; four grandchildren; and several nieces and nephews. Her husband, Mooshie Betzomayeh, is deceased. Funeral services will be held Thursday at 10 a.m. at St. Thomas Church of the East, Cabot Street, New Britain. Burial will be in St. Thomas Cemetery. The Carlson Funeral Home, New Britain, is in charge of arrangements. (ZNDA: Chicago) Marc C. Sargis, son of Raymond F. and Linda L.; loving grandson of Cliffern G. Haka; brother of Ryan; nephew of Clifford (Susan) Haka and Constance (Dr. Kenneth) Yonan; cousin of Joe, Abi, Ken Jr. and Christopher. Funeral ceremony was held on Monday 9 a.m. from Cumberland Chapels, 8300 W. Lawrence Ave. Norridge, IL to St. Andrews Luthern Church, Parkridge, IL. Service 10 a.m. Interment Irving Park Cemetery. To whom shall come this letters, prayers and blessing receive. We greet you with love in the Name of our Lord and Savior Jesus Christ. May this letter finds you in the best of health and happiness rejoicing in all that he has given you by his grace and mercy. We are a small Assyrian Christian group on a mission to find a church in the El Cajon (San Diego) area. We are seeking the support and assistance of wonderful people like yourself to financially help us with your donations to achieve this wonderful cause. We pray with His help that we may find a favor with you in obtaining any generosity to obtain our goal. May His Grace and mercy be upon us all. Please make checks payable to Assyrian Church of the East. LET US THANK GOVERNOR PATAKI ! At the present time, supporters of Turkish historical revisionism are attempting to export Ankara's brand of censorship to the United States. Themis calls on all Hellenes, Armenians, Assyrians and Philhellenes to sign our petition at http://www.greece.org/themis/ny/ Hellenic, Armenian and Assyrian history is not open to debate. We all have a responsibility to remember those who were slaughtered in Asia Minor, to remember those ancient homelands from which Hellenism, Armenians and Assyrians were eradicated, and to educate non-Hellenes of these crimes that were not only against Hellenism, but all humanity as well. Governor George Pataki deserves the thanks of all Hellenes, Armenians and Assyrians for his gesture. Governor Pataki is being heavily criticized by supporters of Turkish Genocide denial, and letters are being sent in urging the Governor to withdraw the proclamation. We urge friends of HEC to thank Governor Pataki by signing the thank you letter at the above mentioned site. Let us always remember the history of Hellenism and Christianity in Asia Minor. History is not debatable. Please sign the THANK YOU note. Please spare us your continued unprovoked attacks on decent Assyrian leaders, such as Senator John Nimrod and Dr. Sargon Dadesho (who was among the three Assyrian leaders recommended by Zinda last week to represent the Assyrians at a future Iraqi opposition conference----I agree). Only your Patron Saint (Yonadam Kana of ADM) has been spared by your censors. Little by little your "Zinda" is becoming "Ketma" (Ash). I notice that your readership is Dwindling rapidly due to your erratic, untruthful and exaggerated reports. 1. The position of Mr. Albert Yalda in the Iraqi National Congress. He dosen't represent the Assyrians. 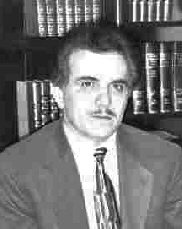 He was one of the 16 Assyrians who attended the INC's General Assembly which met in New York in November 1999. The only Assyrian parties which were invited to that conference were: ADM, ANC, BNDP and APP. The other Assyrian delegates attended as none-affiliated persons. Mr. Yalda is now affiliated with an Iraqi Arab opposition group (The Iraqi National Coalition). 2. Your "interview" with your Patron Saint Yonadam in which it was reported that he has been "appointed" to represent the Assyrians and to "select" the three Assyrian delegates to the upcoming conference in Belgium! This was untrue. No body has "selected" or "appointed" him. The U.S. State Department and the leadership of the Iraqi National Congress, and its Group of 6, have all denied ever appointing a person to represent the Assyrians. At last's Sunday meeting of the "Group of Six" in London, in which 36 prominent Iraqis were invited, representatives of ANC-BNDP, AUA, APP and ADM (Yonadam) were in attendance. Please check your sources before printing such bombastic claims. 3. Your twisted reporting on what Dr. Sargon Dadesho spoke on AssyriaSat and AssyriaVision television program was sad. Your accusations were baseless and childish. As a result of efforts undertaken by Dr. Dadesho, President Bush mentioned the Assyrian name in his speech delievered in Cincinnati last week. This is confirmed. Let's see if you have the guts to print this letter in your next Zinda. [ The meeting in London, referred to by our reader, was not an officially recognized gathering by the United States. The “6 + 3” opposition groups were requested to meet in Amsterdam in September to choose a government in exile. Neither this nor the other proposed meeting in Brussels were attended by these groups. Prior to the 18 September meeting in New York, the U.S. State Department called the representatives of the Assyrian Coalition (does not include Mr. Dadesho’s group) and the Assyrian American League (AAL) to formally request Assyrian participation in these meetings. Zinda Magazine, the only 100 percent censor-free Assyrian news and information medium, continues to enjoy the largest readership of any Assyrian media source around the world with over 100 new subscribers added each month. On 19 October, the AssyriaSat Telecasts World Wide Satellite Service --promoting the aims of the Assyrian National Congress and Mr. Sargon Dadesho’s political objectives and neglecting the Assyrian American National Federation, the Assyrian National Coaltion, and all other major Assyrian political parties including the Assyrian Democratic Movement, Assyrian Democratic Organization, and the Assyrian Universal Alliance-- will commence its programming from KBSV-TV in California. For frequency information visit: http://www.betnahrain.org/assyriasat/assyriasat_01.htm. The Editorial Board of Zinda Magazine invites our journalistic colleagues at the AssyriaVision Television Program, including Mr. Daniali, to follow this publication’s example and establish a truly free and objective medium of exchange and information for the benefit of the Assyrian communities regardless of religious, ethnic, and political affiliation. It is bad to make mistake, but it is absolutely unacceptable for a magazine to repeat the same mistake. Magazine is to report the event and highlight the issue. Other than that it would be a trash reporting with opinions and rumors. The titles and names should be referenced accurately to avoid confusion. It is not BetNahrain's group, it is Bet-Nahrain, Inc, BetNahrain Democratic Party, and Assyrian National Congress (ANC). My name is Sharleen Will, I know it doesn’t sound Assyrian but every drop of my blood is pure Assyrian. I’ve come across your site so many times, and many of those times your articles have made me write to you. You started off very well but now I think you’ve gone off track. You are causing more of a division than unity. First you attack the Church of the East and try to modernize it and change nearly 2000 years of tradition, just because a few Assyrian youth are going to a Baptist church. I can’t see anything wrong with that. They are still going to a place where the word of God is preached. I thought his grace, Mar Bawai Soro’s letter, would have at least some affect on you. His holiness, Mar Dinkha IV, humbled himself and went all the way to Rome to meet the Holy Father in order to solve a small misunderstanding between two churches. Now they are one in faith. The Assyrian Church of East, through centuries, has been through so much and has survived, and will survive your attack. You could have voiced your opinions in better manners by arranging a meeting with any member of the church regarding any views you had towards it. Then you could have printed it in your magazine. What’s next for you to try and modernize and change? Zurna Dawoola wi Shaykhanee? Maybe you’re wanting to replace it with jazz from New Orleans. That will make Assyrians really, really angry. If you are really working to promote Assyrians causes, then you should not have printed the letter in your web site so the enemy could see it. You could have sent it to Dr. Sargon, and the same goes for the Church of East. Did you ever hear of a post office? And then you attack the Assyrians from Iran. There are no Assyrians from Iran, or Iraq, or USA. We are all Assyrians from Assyria. Many circumstances have made us leave our homeland, so please do not label us. The way you wrote it was absolutely disgraceful. I would like to give you an example. Our Blessed Lord had twelve disciples, oh sorry eleven disciples, one betrayed him. And the disciples were from all over Judea and all had different professions, but they were all Israelites. One of them was a doctor, tax collector, and some of them fishermen, but they all had one thing in common, they all loved the truth, JESUS. They were very faithful and hardworking. So are the Bet-Nahrain members. A few months ago, Mrs. Yasmine Dawwed came on television and apologized, saying, “we’ve never been to college, or university, and we don’t have any degrees in this field [television] it is the love for you and our great nation that we are here.” Dear Yasmine, you are right, the Bible says so. “…faith, hope, and love, and the greatest of these is love.” And the Bible also says, “To have good fruit you must have a healthy tree. If you have a poor tree, you will have bad fruit. A tree is known by the kind of fruit it bears,” Matthew 12:33. On the 19th of October all Assyrians around the world will witness the healthy tree who bears the good fruit and spread it’s branches to the four corners of the world. Thank God and thank you Dr. Sargon Dadesho, and all members of Bet-Nahrain. You made every Assyrian dream come true. The healthy tree was planted in rich soil and of course will bear good fruit. The healthy tree is Dr. Sargon Dadesho and the rich soil is the foundation of Bet-Nahrain that was built on love, wisdom, honesty, manners, and loyalty. And the fruit are all the members of Bet-Nahrain, who worked so hard with the great love they have for our great Assyrian nation. And the branches are us, me and you, members of Zinda magazine, and every Assyrian. So it is up to us to look after the branches. We all have to do our part. I was sick and tired of hearing that Dr. Sargon Dadesho was working for himself and his family. He proved everyone wrong. He has been working for each one of us . Let me tell you Zinda magazine how you sound when you write your articles. This Is Very Unprofessional And Very Wrong. What is Mr. Yonadam doing? Working for Kurds? The same as Tarek Aziz working for Saddam Hussein. They keep rubbing it in our faces that they have built Assyrian schools in our homeland. That is great, and I hope we have a million more. Dear Zinda magazine, over hundreds and hundreds of years we’ve been going to public schools in our homeland, and we are still the same, very proud Assyrians who kept their history, language, heritage, and faith alive. What we really needed was a TV because it’s the most powerful thing in the world. The world does not know we exist. The Bible says, “The one who speaks in strange tongues help only himself, but the one who proclaims God’s message helps the whole church.” Having a school is helping a small majority of Assyrian people in a small town, but television will help all Assyrians around the whole world. It will help our children to know everything about their homeland, ancestors, culture, and heritage. I was happy to see the article about Linda George. How much you were praising her, not that she doesn’t deserve it, not at all. Not only is she the most beautiful and talented singer in the world, but she is also a true Assyrian. You could have done the same for the 19th of October by publicizing it more. If your magazine really is for Assyrians, then practice what you preach. What kind of a message are you trying to send? You ask Dr. Sargon to put his personal matters aside but you can’t do it yourself. Someone had to write to you, Zinda magazine, and make you aware that what you are doing is wrong, (printing letters on your web site for the enemies to see). I want you to know that I’m not even a Bet Nahrain member. Maybe not on paper, but in heart and mind and with all my pride, I am. My dear brothers and sisters we have to stop this disease to spread among our nation [JEALOUSY]. The Bible says, “Murder, lie, adultery, theft, all these come out of jealousy. Did you ever ask yourself why all the Middle Eastern countries are against the United States? It’s because they are jealous, not because of the USA’s policy. USA is a free country and they can have any kind of policy and they can help anyone they wish. And now see what is happening. Don’t let this happen among our nation. Dear members of Zinda magazine, please use your magazine to help support and promote the Assyrian cause. May God bless you and bless all the Assyrian people around the world. Long Live Assyria! I cannot believe the Z-Crew would support Sargon Dadisho at all. The remarks that he made should not and can not be tolerated. He has always bashed Zowaa and the AAS when he himself has never done anything in return. What does a local broadcasting company do for the Assyrians. It provides some sort of entertainment, but the media aspect is all one sided. Does he know that there are more schools in Assyrian now then there has been in over 1000 years? Does he know the people he talks trash about in Iraq are the true Assyrians who risks their lives everyday for the Nation of Assyria. He must feel real brave sitting in his office in Bet-Nahrain talking trash when the others like Yonadam Kanna is in Iraq (who by the way is wanted dead or alive) risks his life for the well being of those in Iraq. Bet-Nahrain in California is not the same as the one in Iraq. They are now 2 different organizations, they split from Dadisho because they know the kind of man he is. We have one organization leading all Assyrians and that’s Zowaa. They protect and serve all Assyrians in Iraq. We cannot have a different and separate organization in the US to make any decisions for those who live in Iraq, that simply is not fair. If you my friends are going to support Dadisho at all and not attack him like you attacked John Nimrod when he sent that letter to the government well then I say take me off your list because you are just as bad as Dadisho is. Media should never take the sides of anyone. The main reason for media is "TRUTH", and supporting Dadisho is not honorable, especially after his last remarks. President Bush has been struggling very hard to find a legitimate Iraqi opposition to Saddam. For a long time the US government has been unsuccessful to bring together the different opposition factions to agree on whom will replace the Iraqi dictator once Mr. Bush topples him. A united Iraqi opposition remains a myth. Another myth that Mr. Bush has been advocating in his rationalization for the attack is the creation of a democratic government in Iraq. As Mr. Bush and his advisers know very well, democracy is not instantly created or imposed on a country. It takes many generations under the proper circumstances to develop democracy. There is no hope that the various ethnic and religious groups that make up the Iraqi population will ever agree democratically on a united government. Once Saddam is toppled, there will be a period of a few years of revenge taking by the people who have been traumatized by Saddam’s supporters. Only another dictator will be able to unite Iraq. We pray that the US installed new dictator will possess a little humanity and demonstrate some feelings for the people. The reason for the US failure to create a united opposition is very simple. The Iraqi people who have remained in Iraq and endured Saddam’s abuses will form the next Iraqi government. Those who have been enjoying themselves in the United States and Europe and now wish to go back and take over the government will not form the new government. Assuming that US will impose the outsiders on the new government, it will not last too long. Assyrians in Diaspora especially those in the United States are falsely assuming that they will provide the leadership for Assyrians in Iraq. There is only one legitimate Assyrian political party that will participate in the new government if minorities are allowed a role; that party is the Assyrian Democratic Movement (Zowaa). ADM was created in Iraq, has been managed by Assyrians from Iraq, and has sacrificed a number of its members in the struggle to maintain the Assyrian identity. Only Zowaa is entitled to speak for the Assyrians in Iraq. Admittedly, we have a number of political parties created in Diaspora but these have been and continue to be paper political organizations. Their leaders have no right to make a claim on the Assyrian leadership in Iraq. As a regular reader and admirer of Zinda, I was truly disappointed by its myopic recommendation as to the people who should represent Assyrians in the Iraqi opposition groups. Your call to assemble an “inclusive team of Assyrian political experts from the leading political parties” is a dream as you have correctly stated it. If we have any professionals educated in politics, you will not find them in these parties. What you will find is a number of individuals who have bestowed on themselves the title of Assyrian leaders. The question is who elected them? What is the basis of their claim? What have they accomplished in the struggle for the Assyrian cause to justify their position? The simple answer is nothing, absolutely nothing. A few terms as a state senator or a Ph.D. in nuclear engineering or self-proclamation of leadership do not quality someone to become the leader of Assyrians. We have enough educated, committed, and experienced Assyrians still living in Iraq that can assume whatever positions are given to the Assyrians by the new government. We who have voluntarily left our country and are now enjoying life in a free country have a significant role to play in helping our fellow Assyrians in Iraq. We must provide them meaningful financial assistance and urge our representatives in congress to ensure that the new Iraqi government constitutionally recognizes Assyrians. Let us concentrate on educating our people in this country to become cognizant of their patriotic duty to support their brothers and sisters in Bet Nahrain. Only they can preserve our national identity, perpetuate our language and culture. I read with pleasure the fantastic articles in this week's issue of Zinda, culminating in the historic baptism of all Assyrians by the President of USA when he referred to them for the first time in modern annals by their proper name and not just 'others' or Christian minority. Yet, unfortunately, I have to also refer to the letter from one of your readers under the heading 'The Unholy Alliance', written by a non-existent Edward Eshay. This unidentifiable person seems to thrive on smear and ridicule, which if anything, he only managed to bring about contempt and disdain from me and I'm sure a lot of your readers would have felt the same too. He writes about an issue that has been proven to be false and not worth the time he spent spelling it out. He believes that he's doing a good job for himself and others of his cohorts when he abuses his privilege as a reader to degrade two of our Assyrian Church of the East Bishops, and for what reason? It has become quite clear that the only intention of such writers is a smear campaign against our Church leaders, thinking that in this way they'll succeed where others -including our ardent enemies- have failed. I pity these poor souls who don't even have the guts to put their right names on their signatures. History will show whether our Bishop Mar Meelis has performed his duties in the service of our Lord and our Assyrian nation to the benefit of our church members and Assyrian community and nation, or has failed in doing so; whereas people like Edward Eshay have been in the forefront of those who have done much better and without any failure. I'll conclude by saying that if it wasn't for our Bishop Mar Meelis, we wouldn't have had all this vast combination of religious, social, educational and artistic manifestation that is transparent and demonstrated clearly for all to see and admire, even if people like Edward Eshay are so blind not to even notice them. Long live The Assyrian Nation and long live the Assyrian Church. Your article "the unholy alliance" is missing credibility. The person you have mentioned as Rev. G. Haron was himself accused of embezzling church funds in Melbourne and found guilty by the court in Victoria, consequently he was expelled from doing services there and later he formed a renegade church group of his own, outside the body of our holy Church. I think this tell us something, don't you agree? What you reported could be well founded but the way is backed up or supported makes a weak case. If I were you, I would dig up more for the truth in every story, before it is published. You know the saying "garbage_in_garbage_out". Although, I support free speech and freedom of expression, but I detest irresponsible and erroneous reporting. I must say you are doing a great service to our community, and you should keep it that way. I hope, this time, it was just an oversight on your part. Zinda Magazine and the Assyrian Aid Society of America are pleased to announce a special offer to the Assyrian university students wishing to attend the "Narsai's Taste of the Mediterranean" fundraiser hosted by the Assyrian Chef and Radio Personality, Mr. Narsai David at the Ritz-Carlton in San Francisco on 15 November (see last week’s issue). This very special fundraiser event will benefit the Assyrian university students in Arbil, North Iraq. A multi-course dinner will be prepared by noted chefs of Middle Eastern descent. Miner Family Vineyards and Hanna Winery will present their wines. The event begins with a 6 p.m. cocktail reception followed by dinner and a live auction at 7:30. Several notable local U.S. political figures, Assyrian heads of civic and political organizations, and religious leaders are expected to attend this event. Regular tickets start at $250, but through this special promotion Assyrian university students may attend this event as guests of the Zinda Magazine for only $125. Only a few limited seats are available for this very special offer. Hurry up and reserve your place next to your college friends and enjoy a wonderful night of fabulous gourmet Middle Eastern food and delightful music. For more information write to november15@zindamagazine.com. The kingdom of Hanigalbat appeared in the steppes of northeastern Syria. In around 1250 B.C. the Assyrian king Shalmanassar I decided to annex Hanigalbat to the Assyrian kingdom. He and his successors turned the Syrian steppe into an important part of the Assyrian state. The Euphrates became the official western frontier of the state, but the real border with the fortresses lay about 62 miles to the east, on the Balikh River. In this tumultuous border territory the Assyrian kings built a number of government centers from which they administrated the area. Many papers were presented at the 48th RAI in Leiden, The Netherlands, (July 1-4), 2002, about the new discoveries at Tell Sabi Abyad, Syria. Four abstracts from four papers are presented here and later a description of the site will be demonstrated. This paper dealt with the recent Dutch investigations at Tell Sabi Abyad II. The eight levels of occupation at the small mound have been dated between ca. 7500 and 6800 cal BC, i.e. in the later PPNB period. One of these levels, level 3, has been excavated extensively, and is the focus of this presentation. Architecture, flint and obsidian tools, the so-called small finds, animal bones and plant remains shall be discussed. The conclusion deals with the wider context and the specific nature of Sabi Abyad II. The excavations at tell Sabi Abyad are yielding a wealth of new, stimulating data concerning the development and the spatial lay out of this Late Neolithic Village. Recent work concentrated on the southeastern part of the village during the earlier stages of the Transitional period between the Pre-Halaf and Early Halaf (ca. 6100-5900 BC). The excavations added a number of characteristic, multi-roomed rectangular buildings and round tholoi to the “Burnt Village” (ca. 6000 BC). The large exposure of the Burnt Village leads to intriguing questions concerning the social organization of the village. Recent excavations at the opposite part of the mound made it possible to look at the village lay out from a broader perspective, and to address topics concerning the size of the settlement through time and the scale of the social interaction going on. During the excavations at Tell Sabi Abyad several kinds of archives were uncovered. A static archive, consisting of sealed judicial documents, was found in stacks, whereas several dynamic archives, among which that of the abarakku, were found in offices or houses. Scattered documents dating from the last limu’s were found at many different places. The find-spots of these archives reflect Mesopotamian administrative practices. Recent work at Tell Sabi Abyad in northern Syria revealed an excellently preserved Middle Assyrian fortress (dunnu), dated ea. 1200 BC. The fortified area was surrounded by a wide and deep moat. Domestic buildings stood nearby. Monumental residences, administrative buildings, living quarters, etc., have been exposed. In-situ finds occurred in all buildings and all rooms therein, and included ceramics, stone implements, metal weaponry and tools, seals and sealing, etc. Hundreds of cuneiform tablets have been found, referring to a wide range of both official and personal activities of a number of high-ranking Assyrian officials, such as grand vizier Assur-iddin and his son (and grand vizier) Ili-ipadda. These top officials were each responsible for the administration and protection of the westernmost province of the Assyrian kingdom. Tell Sabi Abyad, an Arabic term meaning “The White Boy Mound”, is situated some 50 miles north of the city of al-Raqqa on the western side of the Euphrates River in Syria, towards the Turkish borders. The original Assyrian name of the frontier settlement at Tell Sabi Abyad has not been discovered yet. The fortress is roughly 200 x 200 feet and its walls are about 6 feet wide and 18 feet high. Some 300 clay tablets were found dating from the Middle Assyrian Empire containing texts of official and personal activities of Assyrian officials at the fortress. Some 50 burial places were discovered at the site and cremated remains were found in jars set inside designated pits. The jars included, besides the remains, much jewelry, precious stones, rings and other valuable pieces. A brewery was established in the fortress to provide the necessary beer for the high officials inside the fortress. High cultural evidence is obvious throughout the texts provided by the clay tablets and offerings to the temple of Sin were mentioned too. This Assyrian western frontier was not a small settlement, rather enormous and the occupants, whether farmers or soldiers, were Assyrians from Nineveh. The archives show that all the villagers had typical Assyrian names. Cuneiform texts excavated at the site show that it was part of the private estate of a powerful Assyrian: Grand Vizier Ili-ippada, who was a member of the royal family and was allowed to call himself 'King of Hanigalbat'. He usually resided elsewhere, but was there from time to time to make sure things were all right. The fortress has a number of functions: border fortress, customs office and administrative center for the agriculture in the region. Merchants from the Mediterranean Sea and other visitors from Carchemish were required to pass through this fortress before proceeding to Nineveh. Although the fortress seems to have been abandoned in the 11th century B.C., but there seems to be signs of re-settlement in later times, which needs to be studied further. As further excavations are undertaken in north of Iraq, Anatolia and Syria, a certain fact asserts itself deeper and that is that Assyrians had established many settlements outside the Assyrian heartland. This new findings should help yet further in understanding the complexity of the Assyrian administration system. And to those interested in the Assyrian continuity, this new discovery should add further evidence to the fact that the fall of Nineveh did not result in the wiping of the entire Assyrian population. Bar Yohanon is the pen name of Dale A. Johnson, a friend of Zinda Magazine and the advocate of furthering Syriac studies and the Syrian Orthodox Church liturgy. On 29 July 1991 Bar Yonanon was ordained Syrian Orthodox priest in Hackensack, New Jersey by His Grace Mor Athanatias Y.Samuel. He has spent a large portion of his adult life studying Syriac texts with an emphasis on the 4th through 6th century monasticism of the upper Bet-Nahrain (Mesopotamia) region. Bar Yohannon has already served many parishes in America, including the parishes in Portland, Oregon; Long Island, New York; and Tur-Abdin villages of southeast Turkey, where our magazine discovered his love of the Syriac churches and language. Between 1990 and 2000 Bar Yohannon lived at Mor Gabriel Monastery in Tur-Abdin and through the United Nations and the World Council of Churches assisted the Assyrian community in southeast Turkey in various capacities. Both books can be ordered online at http://www.newglastonbury.org/Books.htm.